The United States is the world’s largest exporter of agricultural products, and is also one of the top food-producing countries due to its large expanse of land and relatively low population density. According to the 2012 census of agriculture, the U.S. has 2.1 million farms, covering 915 million acres. Even though every state is involved in the agriculture industry, the vast majority of farms are found in the Midwest/Great Plains area, due to this region’s flat, arable land. As a result of geography and different levels of urbanization, each state’s level of agricultural production varies significantly and so do the agricultural products that each state specializes in. 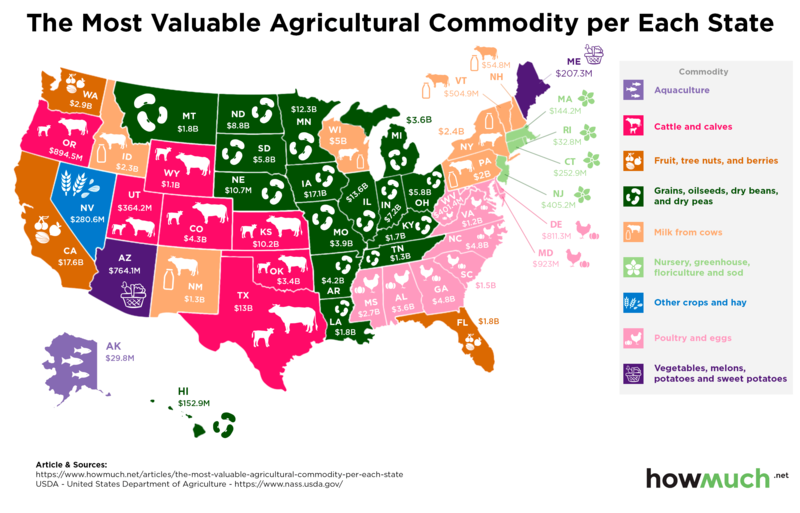 Our latest visualization uses data from the U.S. Department of Agriculture to map out the most valuable agricultural commodities in each state, as well as the total price for that commodity. Agricultural products include crops, plants, livestock, poultry, dairy, and more. As you can see in the map above, some states have a much higher-value agricultural production than others. There are also several regional trends that appear in the visualization. For example, most of the Midwest produces grains, oilseeds, dry beans and dry peas as their most valuable agricultural commodity. In the Southeast, poultry and eggs are the main agricultural product. In the Southwest, cattle and calves are more popular. In the Northeast, the two main agricultural commodities are milk from cows and nursery, greenhouse, floriculture and sod products. There are also a few outliers, such as the aquaculture industry in Alaska and the vegetables, melons, and sweet potatoes industry in Arizona and Maine. The agricultural products corresponding to the highest values on the map tend to be grains, oilseeds, dry beans, and dry peas. Conversely, products related to nursery, greenhouse, floriculture and sod, as well as aquaculture, have the lowest values on the map. In general, states in the Northeast (which tend to be smaller in area and/or more heavily urbanized) have lower levels of agricultural output than states in the Midwest, the South, and California. Interested in how other types of economic production differ across states? Here is our visualization of the most profitable industry in each state.